Just like outside air pollution is dangerous, your home’s indoor air quality may be harming you and your family. “The air in your home can be dirty and hazardous to your health. In fact, indoor air quality can be even more polluted than the air outside,” warns the American Lung Association (lung.org). The EPA defines air quality as the healthiness of the air inside homes and says it can be compromised by factors that include too much or too little humidity, a lack of ventilation, and airborne contaminants like pet dander, dust mites, bacteria, mold, viruses, dust, and pesticides. Health problems that can arise from these factors include allergies, asthma, coughing, sore throat, congestion, eye irritation and flu-like symptoms; plus eye and lung irritation, blood and liver issues, and even cancer. 1- Have an HVAC professional inspect your system regularly. If your HVAC system is poorly maintained, indoor air quality suffers. Microbiological organisms like the growth of fungi or bacteria, the dispersion of easily inhaled particles and damp indoor spaces can run rampant. Each season your system should be inspected to make sure it is working up to its potential and meeting clean air standards. Our HVAC service technicians can save you money and keep your system running smoothly. 2 – Install blown insulation. 3 – Consider professional duct cleaning. You probably already know that if your air ducts are dirty, clogged, or in poor condition, your energy bills will be higher. However, compromised air ducts also contribute to degraded air quality which affects your health. Using highly effective, sophisticated and safe equipment Custom Climate Concepts’ duct cleaning professionals can reduce and eliminate molds, mildew, bacteria and high levels of dust and odor, as well as odor-causing microorganisms. 4 – Install Germicidal UV Light. HVAC UV lights can be used to purify your system in two ways. With ‘coil sterilization’ the UV light will destroy 99 percent of all molds in line-of- sight of the bulb, keeping the coil mold-free. 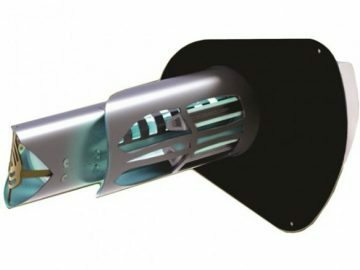 In ‘air sterilization’ a UV light unit is installed in the return air duct. It cycles with the air handler blower to sterilize moving air. These in duct purification devices are very effective. 5 – Check out air cleaning devices and filters. Two types of air cleaning devices can remove or prevent particles, allergens and odors from entering the air in your home: mechanical air filters and electronic air cleaners. Electronic air cleaners mostly use a process called electrostatic attraction to trap charged particles. Mechanical air filters, known as high efficiency particulate air (HEPA) filters, use air forced through a special screen to trap allergens and capture particles on filtering materials. 6 – Change your air filters monthly. This tip is one of the easiest because it doesn’t involve a professional and you can do it yourself. Check for the air filter size on the air handler unit and keep a few in storage so there are no excuses when it’s time to switch.